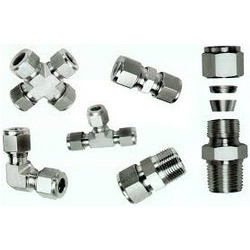 We are a leading Manufacturer of instrument fittings from Vadodara, India. We are one of the widely acclaimed manufacturers and suppliers of Ferrule Fittings. The offered ferrule fittings are compression fittings which are designed in the shape of tapered concave and conical seat. Our supplied ferrule fittings consist of hollow barrel shaped compression ring and a compression nut.